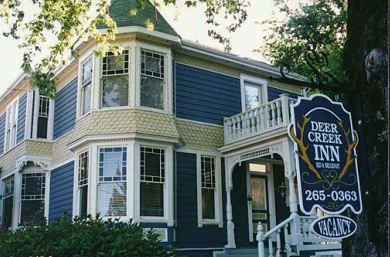 The Deer Creek Inn is a beautiful historical building in Nevada City, CA. It's a Queen Ann Victorian and it is full of beautiful windows in every room. We installed Castle Window Covers throughout the structure, preserving the classic, beautiful antique windows without having to replace them. We also didn't have to modify the structural integrity of the building, all while helping them save on heating and cooling costs all year long. "After having Castle Window Covers installed in the rooms at our Inn, the guests commented on how comfortable and surprisingly quiet the rooms were. The best part is the significant savings in our utility bills while keeping our guests comfortable at the same time." The Deer Creek Inn is full of beautiful, decorative antique windows that needed to be preserved, and could not - by law - be replaced (not that anyone would want to do that, anyway! ).